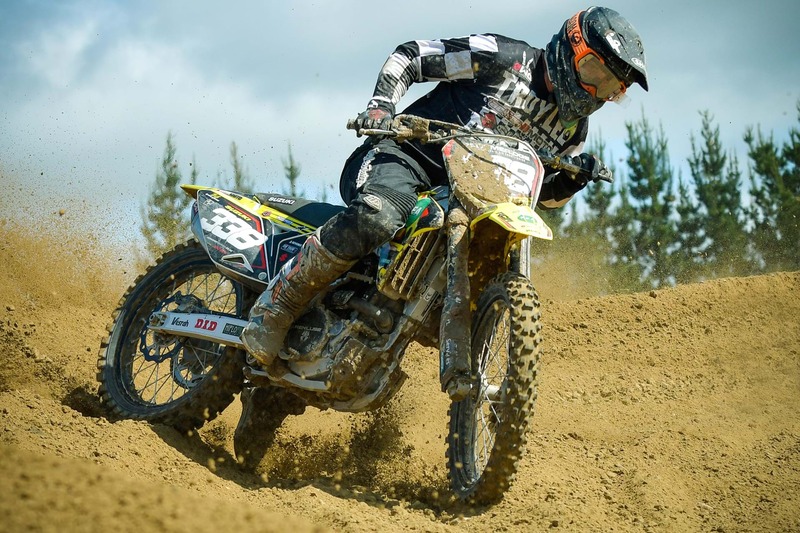 Suzuki’s Brad Groombridge raced his RM-Z450 to victory the annual Acerbis Four-Hour cross-country dirt bike race near Taupo in New Zealand at the weekend. The 28-year-old Taupo rider made it a record sixth time that he has won the race outright, on five of those occasions riding it solo against numerous two-rider combinations. This year he was a solo ‘Ironman’ entry again and it was a thrilling finish to the race that actually extended to four-and-a-half hours for the leading riders; as they arrived at the timing zone just before the race clock had ticked over the four-hour mark and so were forced to complete an additional lap. Groombridge finished the gruelling endurance race just 13 seconds ahead of the runner-up two-rider combo of Paul Whibley and Callan May, with James Scott and Richard Sutton teaming-up to claim the third podium spot, crossing the finish line nine minutes further back. In addition to dominating this event over recent years, Groombridge (Kea Trailers Suzuki Racing Team) is the current national cross-country champion, the 2018 national enduro champion and the 2018 national MX2 motocross No.2 as well, so it should probably have come as no surprise to anyone that he and his versatile RM-Z450 would again be a potent force on Saturday. Groombridge, said, “There wasn't much in it at the end. It was tough and my body certainly feels it. I just did enough to get the job done. "I was inside the top 10 at the start and had worked my way up to third position by the end of the first lap. Then I passed Callan and Reece Lister when they came in to refuel. I had a big tank on board and so didn't need to refuel too much. "The dust was pretty bad, the track cut up quite rough and I had a few blisters forming on my hands. I managed to build a little bit of a lead again. I played it smart, took no risks and maintained the gap until the end. "My fitness is not quite 100 percent at this early stage of the season, but I guess I was still fitter than a lot of the other riders. There were massive holes in the ground and tree roots starting to show through near the end, so it was quite tricky in places."